Sales of dairy milk seem to be falling, and the dairy industry is getting increasingly nervous. What could possibly be the reason for this? It’s the fact that more and more people are opting for a plant-based lifestyle and shying away from animal products. Non-dairy milk, for one, is gaining a lot of popularity lately. According to a report from the market research organization Mintel, non-dairy milk sales have grown steadily over the past five years—by an astounding 61% since 2012! The top three sellers are almond milk (64% market share), soy milk (13% market share) and coconut milk (12% market share). The same report shows that overall sales in the dairy milk category have fallen by 15% since 2012. No wonder the dairy industry is hitting back by running advertising campaigns that criticize their non-dairy competitors. They are promoting dairy milk as the cleaner, healthier alternative to non-dairy milk but there are many great-tasting and healthy non-dairy milks in the market that do not contain any antibiotics and hormones. Non-dairy milk is milk derived from non-animal sources, and with more people adopting a vegan diet, these days it is becoming the milk of choice among health-conscious consumers. These consumers are choosing to drink non-dairy milk because of personal preferences, allergies, dietary restrictions, and intolerance. To be honest, cow’s milk contains several nutrients like high-quality protein, essential B vitamins, and minerals such as calcium and phosphorus. Some people are opposed to consuming any animal products for ethical reasons, whether they reject the inhumane slaughter of animals or their exploitation by humans in general. They prefer to have a vegan diet, so naturally, dairy milk coming from animals takes a severe hit. In a global perspective study published in the journal Nutrients in 2015, researchers noted that around 75% of the world population was intolerant to lactose, the sugar found in milk. This condition results when people have a deficiency in lactase, an enzyme that digests lactose. According to a 2007 study, published in The Journal of Allergy and Clinical Immunology, two to three percent of children below the age of three years are allergic to cow’s milk. For these children, consumption may lead to symptoms like vomiting, diarrhea, rashes, and severe anaphylaxis. The silver lining is that 80% of these kids outgrow this allergy by the time they are 16 years of age. Some people are anxious about the likely presence of contaminants like pesticides, antibiotics, and hormones in cow’s milk. This is why they stay away from dairy milk. 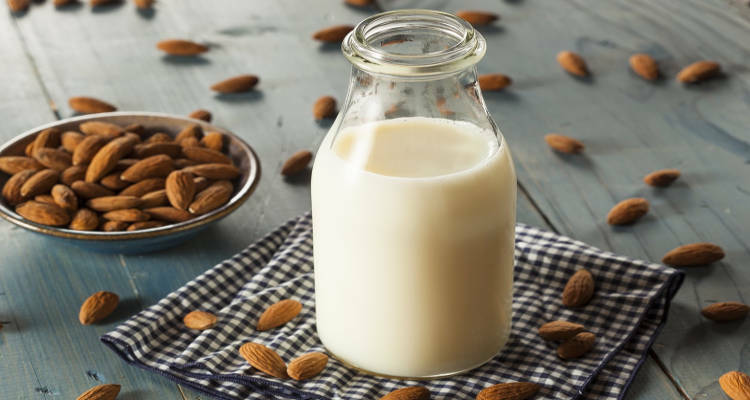 One cup of almond milk, made from ground almonds and water, contains some 35 calories, 2.5 grams of fat, 180 milligrams of sodium, one gram of protein, and zero cholesterol. Almond milk has a taste that is slightly sweet and a little like almonds. It is a good source of calcium, vitamin D, and vitamin E, which are all essential for your body. The problem with some versions of almond milk is that they contain little to no protein and excess sugar, which is harmful to the body. You can use almond milk as a healthy substitute for dairy milk, and it is excellent for cooking and baking. Almond milk comes in different flavors like vanilla and chocolate—which are also often higher in sugar—and is ideal for cereals, oatmeal, and smoothies. One cup of coconut milk, made from coconut meat and water, generally has about 70 calories, four grams of fat, and 40 milligrams of potassium. However, it does not contain any sodium, protein, and cholesterol. It has a sweet but subtle flavor of coconut and is rich, thick, and creamy. While it is free of dairy, lactose, soy, casein, gluten, egg, and MSG, one downside is that it contains no protein, which is paramount for building and repairing muscles. You can use coconut milk in curries, hot cereals, pasta sauces, for thickening smoothies, and in smoothie bowls. One cup of oat milk, a mixture of steel-cut oats and water, offers around 130 calories, 2.5 grams of fat, 115 milligrams of sodium, 24 grams of carbohydrates, four grams of protein, and no cholesterol. The drink will remind you of the taste of skimmed milk, which is not too creamy or watery, and has a sweet oat taste. Oat milk contains the second-highest amount of protein among all non-dairy milks, but the downside is that it could contain up to 20 grams of sugar per serving. You can use it in batters, porridges, and baked food. One cup of soy milk (well-soaked and ground soybeans and water) provides about 100 calories, 4.5 grams of fat, 95 milligrams of sodium, 380 milligrams of potassium, and eight grams of protein. It is not too sweet but it’s pretty thick due to its fat, protein, and fiber content. A common complaint against earlier forms soy milk was that they were too chalky, but with new knowledge in hand, manufacturers have made improvements to the milk’s flavor and texture. Soy milk can stand up to dairy milk because it contains just as much protein but has fewer calories than whole milk. People who suffer from thyroid disease must avoid large amounts of soy milk. Moreover, it contains phytoestrogens that function like estrogen in the body, and too much of it can raise the risk of breast cancer. Soy milk has a neutral taste, so it is ideal for use in baked goods, cereals, and coffee. One cup of cashew milk (ground cashews and water) contains roughly 60 calories, 170 milligrams of sodium, 30 milligrams of potassium, one gram of protein, and no cholesterol. It is creamy and sweet with a slightly nutty flavor, which makes it ideal for use in coffee drinks like lattes as the milk taste does not drown out the coffee taste. Cashew milk is very healthy for the body as it contains vitamins D and B12, calcium, and zinc. However, it has no protein. One cup of rice milk (milled brown rice and water) has around 120 calories, 2.5 grams of fat, 80 milligrams of sodium, 23 grams of carbohydrates, and one gram of protein. It is thin and runny in composition and has a sweet taste that makes it suitable for preparing baked foods. People who are extra sensitive to dairy, nuts, or soy will find rice milk very well-suited to them. The problem is that it has much less protein and double the number of carbohydrates found in regular milk. Also, if you’re using it for dairy-free sauce, you’ll need some xanthan gum to thicken it up. One cup of hemp milk, made of hemp nuts and water, provides about 80 calories, eight grams of fat, 125 milligrams of sodium, two grams of protein, and a single gram of carbohydrates. It is thick, has a creamy texture, and tastes a little sweet, grass-like, and nutty. Its smooth texture lends itself to making delicious ice creams at home. Vegans should consider switching to hemp milk because it contains higher levels of omega-3 fats when compared to other non-dairy alternatives. The problem with using hemp milk in hot beverages like coffee is that it separates, leaving floating chunks. Another reason why consumers might back out of using hemp milk is that it is a bit more expensive than the non-dairy alternatives. One cup of flax milk offers 25 calories, 2.5 grams of fat, lots of omega-3 fats, but no fiber and protein. It is thin and smooth, and can be used in cereal, coffee, or even be drunk straight out of a glass. Flax milk can be used in both sweet and savory recipes to prepare tasty dishes for your family and friends. Dairy Milk vs. Non-Dairy Milk: What Are the Differences? Most dairy milk ingredients simply include animal milk, and sometimes vitamins D and A depending on the fat content. The problem arises with the animal source. In order to boost milk production, some dairy cows are routinely injected with growth hormones and antibiotics. They may also feed on grass, corn, or hay sprayed with pesticides. These chemicals may end up in the animals’ milk and passed on to human consumers. Since most non-dairy milks are plant-based, these dairy farming practices are not a concern. Dairy-free milk is also free of lactose, the naturally occurring sugar that requires the enzyme lactase for its complete digestion. This makes the plant-based milks a better option for lactose intolerant individuals. On the other hand, some plant-based non-dairy milks contain added ingredients such as sugar, salt, thickeners and stabilizers, sunflower lecithin, calcium carbonate, zinc gluconate, vitamin E acetate, and vitamins B12 and D2. Dairy milk is naturally nutrient-rich, providing calcium, potassium, and vitamin D, among others. These three nutrients are among the four nutrients that are lacking in the diet of many Americans, including children, according to the Dietary Guidelines for Americans. One cup of dairy milk contains eight grams of protein while non-dairy milks like almond milk and rice milk have only a single gram of protein. Dairy milk also contains much more calcium than non-dairy milk, which usually has to be fortified with calcium. Regular dairy milk also has no added sugar, while most non-dairy milks contain ingredients like cane sugar or cane juice, which drum up the added sugars in them. Furthermore, non-dairy milks that provide the same number of nutrients as dairy milk typically cost much more. But for people who are allergic to dairy or oppose its consumption on moral grounds, the higher price is likely worth it. The bottom line is, you should read the label and check the ingredient list before you buy any dairy or non-dairy milk from the market. Many different brands of dairy-free milk are available on store shelves these days. You will easily find them in the dairy section of grocery stores and supermarkets. They are also available in various online stores and e-commerce web sites, so you don’t even have to step outside your door to get them. However, you should definitely read the nutritional details on the label of the container every time you buy dairy-free milk. Different brands have differences in their ingredients list, and it is safe and smart to know them before you buy their product. Dairy-free milk is the milk derived from non-animal sources and is becoming increasingly popular these days. Many people are turning to more plant-based, vegetarian or vegan diets and are shunning dairy milk as it is animal-based. The sales of dairy-free milks are rising much to the consternation of the dairy industry. People are choosing dairy-free milk for reasons such as milk allergies, lactose intolerances, moral beliefs, and the potential presence of contaminants in dairy milk like pesticides, antibiotics, and hormones. There are several kinds of dairy-free milks available in your local grocery stores and supermarkets, which you can easily use as substitutes for dairy milk. Some of them include almond milk, coconut milk, oats milk, soy milk, cashew milk, rice milk, hemp milk, and flax milk. However, these substitutes tend to be a little higher priced than regular dairy milk. You can make all of them at home at half the cost and without the additives sometimes found in commercial options. Nutrient for nutrient, regular dairy milk still costs less than dairy-free milk and packs a solid punch! The choice is up to you. You Asked, We Answered: Is Coconut Milk Healthy? Nixon, L.S., “What Is Non-Dairy Milk? (Everything You Need To Know),” Happy Herbivore, https://happyherbivore.com/2013/03/non-dairy-milk/, last accessed November 20, 2018. Coyle, D., “The 9 Best Non-Dairy Substitutes for Milk,” Healthline, January 17, 2018; https://www.healthline.com/nutrition/best-milk-substitutes, last accessed November 20, 2018.
http://www.mintel.com/press-centre/food-and-drink/us-non-dairy-milk-sales-grow-61-over-the-last-five-years, last accessed November 20, 2018.
https://nutritiondata.self.com/facts/dairy-and-egg-products/69/2, last accessed November 20, 2018. “Almond milk, unsweetened (1 cup) serving,” SELFNutritionData; https://nutritiondata.self.com/facts/custom/2136835/2, last accessed November 29, 2018. “Cow’s milk allergy: evidence-based diagnosis and management for the practitioner,” NCBI, February 2015; https://www.ncbi.nlm.nih.gov/pubmed/25257836, last accessed November 20, 2018. “The Interrelationships between Lactose Intolerance and the Modern Dairy Industry: Global Perspectives in Evolutional and Historical Backgrounds,” Nutrients, September 2015; https://www.ncbi.nlm.nih.gov/pmc/articles/PMC4586535/ last accessed November 20, 2018.
https://www.ncbi.nlm.nih.gov/pubmed/22430502, last accessed November 20, 2018.
https://www.thespruceeats.com/best-non-dairy-milk-alternatives-1000954, last accessed November 20, 2018.
https://www.health.com/health/gallery/0,,20987568,00.html?slide=234999#234999, last accessed November 20, 2018.
https://www.goodhousekeeping.com/institute/a24493/non-dairy-milk/, last accessed November 20, 2018.
https://www.health.com/health/gallery/0,,20987568,00.html?slide=234987#234987, last accessed November 20, 2018.
https://www.health.com/health/gallery/0,,20987568,00.html?slide=235029#235029, last accessed November 20, 2018.
https://www.health.com/health/gallery/0,,20987568,00.html?slide=234986#234986, last accessed November 20, 2018.
https://www.health.com/health/gallery/0,,20987568,00.html?slide=234962#234962, last accessed November 20, 2018.
https://www.health.com/health/gallery/0,,20987568,00.html?slide=234955#234955, last accessed November 20, 2018.
https://www.health.com/health/gallery/0,,20987568,00.html?slide=235011#235011, last accessed November 20, 2018.
https://www.onegreenplanet.org/vegan-food/non-dairy-milk-guide-for-all-your-cooking-and-baking-needs/, last accessed November 20, 2018.
https://milklife.com/articles/nutrition/real-milk-vs-non-dairy-milk-whats-difference, last accessed November 20, 2018.